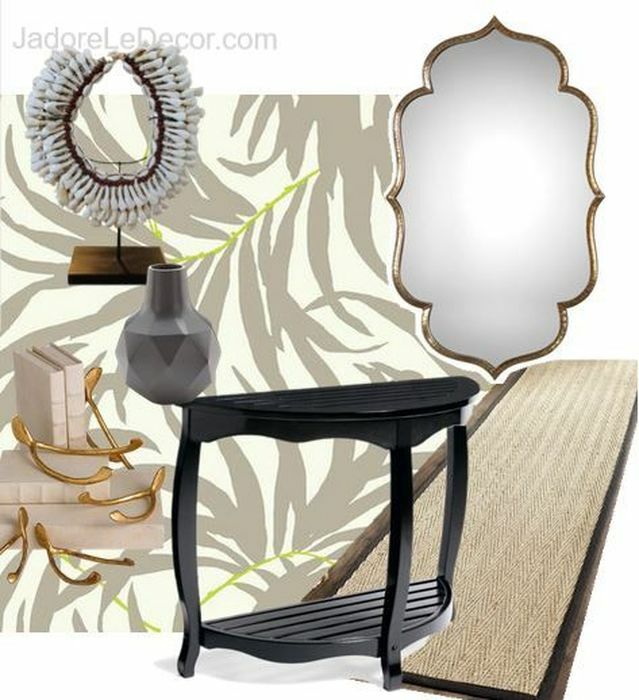 Welcome to Week 3 of the One Room Challenge, where I along with more than 200 other bloggers are making over one room of our choice in 6 weeks or less. The event is sponsored by CallingItHome and media partner House Beautiful. 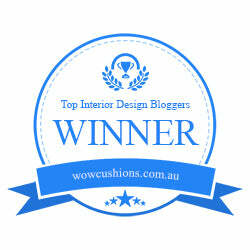 To view the progress of others participating in this challenge click here; and here to view the 20 featured designers. 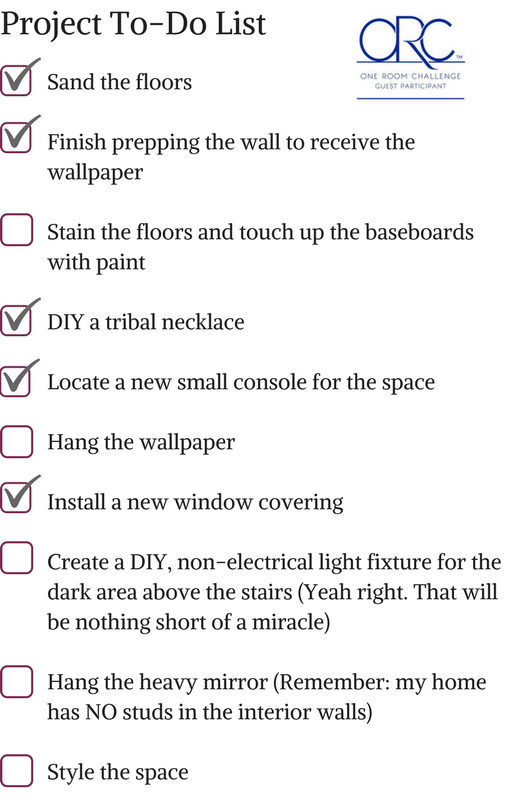 Last week was filled with dashed makeover dreams. But I’m happy to say that the past 7 days have been gloriously productive. I even have a little DIY to share with you. 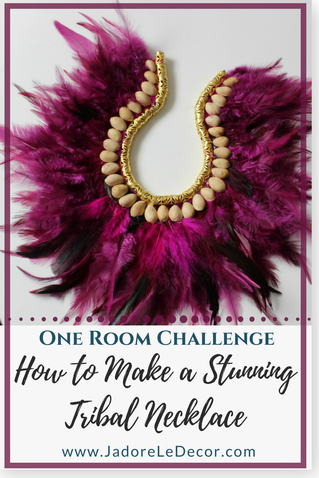 What I’m most excited to share with you today is a tutorial on how to make a shamefully easy and stunning tribal necklace. Que le lecteur soit averti cependant (let the reader be warned though) I am not known for using conventional materials in my craft projects. Remember this piece from my inspiration post at the beginning of this challenge? Several of issues with this: 1) While I like the look of this tribal necklace, I am NOT a fan of the teeth. 2) I'd like to be able to infuse more color into the overall design of the space. 3) This South African chef-d'œuvre costs a cool $700. And since Ola ain't rollin' in the dough like that, I need to create a clever imitation. Soo… I’ve been saving this bag of washed pistachio nuts (yes, you read that correctly) with the hope of creating something textural and artsy with them. Then it dawned on me that THIS was the project I had been waiting for. So let's get to it. **Of course you can also buy shells. I've linked one option here, as well as below. Keep in mind however, that the heavier the shell, the more durable the glue will need to be. In this case, E6000 is the glue I recommend. 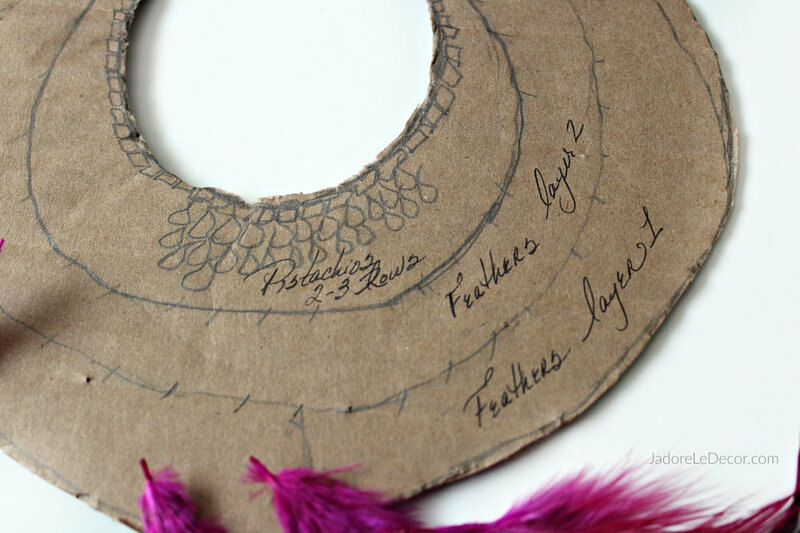 Step 1: Draw out the desired shape of your “necklace” onto the cardboard. When you are satisfied with the shape you’ve drawn, cut it out. Step 2: (Optional) Using the cardboard cutout as a template, cut the felt into the exact same shape. This felt will be used on the back of your piece. If the necklace will be placed in an area where it can be seen from all sides, you will not want to skip this step. Step 3: DO A DRY RUN. It may be tempting to just start gluing the feathers in place without a clear plan – don’t. Hot glue on feathers is virtually permanent. To avoid that nightmare, make sure you have enough of feathers to sufficiently cover your template by doing a dry fit. Notice how I traced out my glue path directly on the cardboard. Once you are satisfied with the layout, begin gluing on the feathers. I was able to get two full rows of feathers on my template. NOTE: Make sure to leave enough space at the collar of the “necklace”. 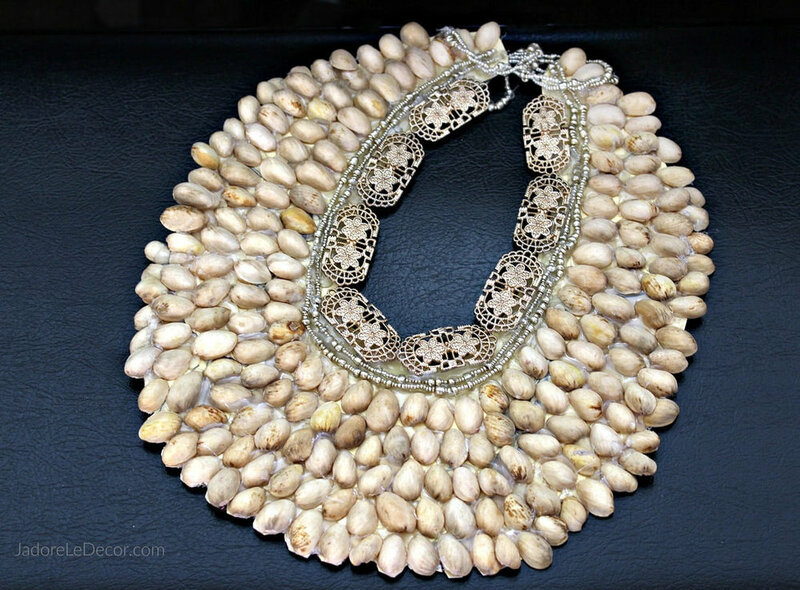 Step 5: BEFORE adding the pistachio shells, trim the collar of the “necklace” with a border of beads. I used soft gold metal embellishments (often used for braids and dreadlocks). These can be applied by simply gluing them on top. They can also be opened to allow the cardboard to slide in between and then pinched onto the sides of the collar. Step 6: (OPTIONAL) As you can see from the photos, I had some loose feathers already on hand that I had purchased a few years back. This is totally optional, but I chose to fill in the open space with those loose feathers. Step 7: Fill in the remaining area with pistachio nut shells. Add the felt backing and chain to finish your piece. Et voila! You are done! I had so much fun with this project that I made a second necklace using the same method - but with the pistachios only. I also incorporated a few more pieces of left over jewelry. I have no idea which one I like best. But I think I’ve found a way to use both of them in the finished space. For now though tell me please, which one is your favorite? Would you like to see which rooms some of the other participants are doing in this challenge? Click here to view their projects.